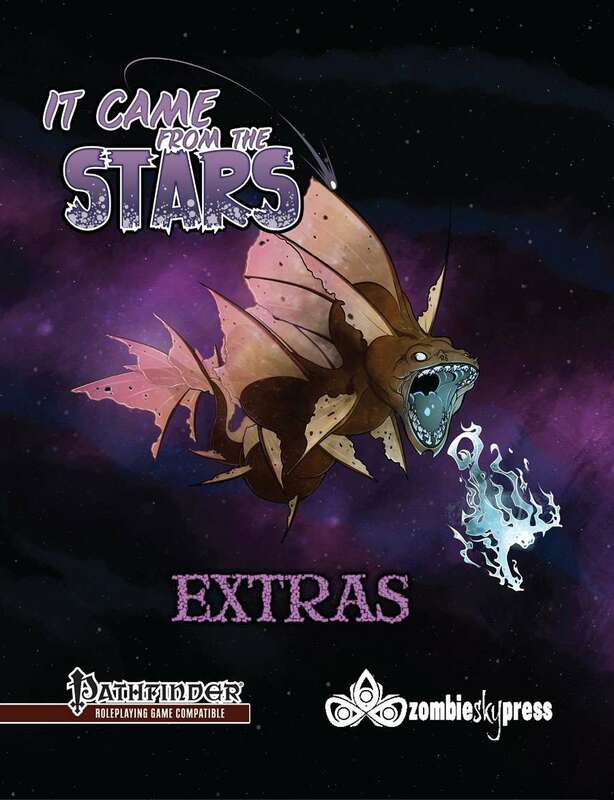 It Came from the Stars Extras adds to the mystery of the unknown and the weird that the It Came from the Stars Campaign Guide got started. Add new player options, new monsters, and more to your Pathfinder Roleplaying Game. Mystery, wonder, and terror from the starry vastness await you. Whether you play in a world that is already aware of what lies beyond or that has been so far oblivious, it’s about to get ugly. Discover bold new options for characters: Fantastic psychic abilities. Strange alien technology. Mindwarping secrets. Will you stalwartly oppose the madness or will you give in? Can you twist the dark whispers to your own advantage? Confront challenging new foes and obstacles: What can you hope to do if a devastating alien force comes to your world? Plunge into harrowing adventure: The stars are here! Stave off invasion. Discover derelict technologies. Plunge yourself into worlds unknown. How will you fare in the coming confrontation? This title was added to our catalog on September 28, 2013.